Protein 18.5%, Oil 8.0%, Fibre 3.0%, Ash 9.0%, Vit A 8000 iu/kg, Vit D 1500 iu/kg, Vit E 50 iu/kg, Moisture 8%, Copper 15mg/kg, Sodium 0.56%, Calcium 1.39%, Phosphorus 0.83%, Magnesium 0.10%, EFA 3.68%. My dog has a skin allergy and this food was recommended for her by my Vet over a year ago, it really is the best food and she loves it....well to be fair she just loves food! but this has made such a difference to her. 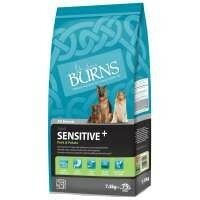 This is an excellent food but especially for any dog with a sensitive digestive system - my dog is epileptic and has not had a fit since fully changed onto this food! She is in lovely condition and although it seems a strange choice - it really works for her.